Personalization is more than a buzzword in marketing — it is an expectation. According to a survey by Kahuna, 86% of consumers say personalization plays a role in their purchasing decisions. In the same survey, 48% of senior marketers said personalized media programs led to improved response rates and increased sales. 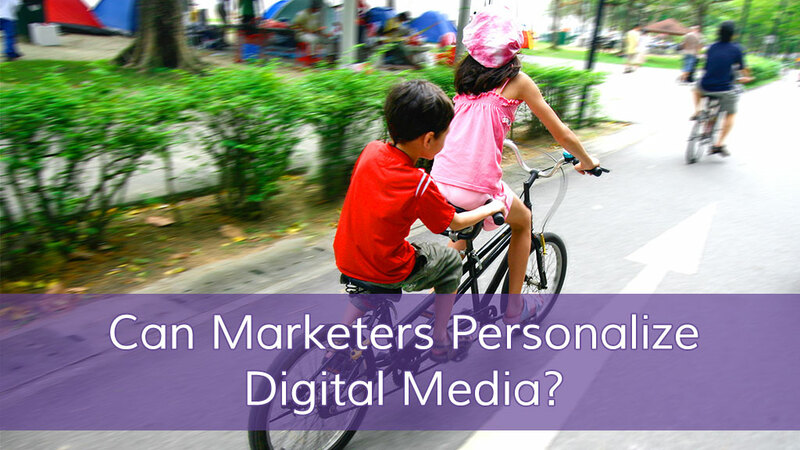 Digital marketing is a beautiful space for personalization. We can target the customer journey states, avoid overlap in targeting and produce a personalized media experience. A well-segmented CRM database makes this process even more achievable. Digital media has become much easier to personalize through advancements in CRM segmentation and targeting. Now marketers can not only personalize the content of digital media but can also deliver it to the consumer at the time they want or need to see it. Digital media refers to banner ads, video ads, organic social, native ads, email, paid search and organic search, among others. By aligning digital media to the customer journey, we can capitalize on the strengths of each digital marketing medium and ultimately improve customer experience. To create alignment between digital media and the customer, marketers can use the customer journey map. This map represents an audience member’s journey in the buying cycle from before they know a brand exists, through conversion, and finally to customer loyalty. The individual customer journey states are See, Think and Do, a framework we adapted from Avinash Kaushik. However, it is important to note that not all digital marketing mediums are created equal. While paid social, for example, may be great for Think state content, it is not ideal for the See state. In the same vein, video ads are perfect for See state but present challenges for Do state content. We’ll explain why this is the case later on in this article. Below we outline eight of the most common digital mediums and which of the three journey states they best reach. Banner ads can offer a personalized experience to audience members both through creative design and through data and advanced targeting methods. Depending on the data we have available — either first- or third-party — we can align our banner ads to the customer journey. First-party data is the most effective at aligning banner ads to the customer journey because the prospect’s interaction with our site is a signal of where they are in their journey. For example, if a prospect fills out a form to receive a gated white paper that we have identified as Think state content, then we know that the prospect is in the Think state. Third-party, or behavioral, data is not always as transparent. Third-party data is curated by outside vendors. So, while we can know that these audience members are in market, we don’t know their journey state. To get around this lack of transparency, marketers can cookie these audience members by journey state as they interact with our content. We can also label them in our marketing automation system as being in the See, Think or Do states. Once an audience member has been cookied and labeled in our system, we can create lists segmented into See, Think and Do, and so retarget our banner ads. Video advertisements are quickly becoming the primary medium on the Internet. They are not only one of the highest ranking ad formats in terms of consumer recall but they also meet the demands of a new audience that uses the Internet, rather than television, for video entertainment. HTML5 video ads and animated gifs have the same targeting ability as banner ads with first- and third-party data. But video ads in the form of pre-roll advertisements are special cases. Pre-roll video is an ideal medium for See state targeting because it can build brand awareness and affinity with an audience that is not even thinking about our brand, product or service. If we can capture that person’s attention, in an ideal length of time, we can make a brand impression even if they are not in the market for our service or product. One note about video ads: we must always be aware of the call to action and how accessible it is for different types of users on different platforms. Not every platform allows us to include a link with our video, and so some workarounds might be necessary. Also, if people are watching YouTube from their TV they will not be able to take action on our video ad without first grabbing their cellphone and visiting the website. That is a hard ask. On average, more than 1 million pieces of content are shared on Facebook every minute, yet the average user misses 70% of the news feed. With organic reach on the decline, paid advertising is an advantageous way for marketers to cut through the clutter and deliver content to their target audience. Paid social advertising targets users’ interests or behaviors. Unfortunately, a lot of targeting data in social media channels are limited to what users put in their profiles. This information isn’t always an accurate picture of that audience member’s state in the customer journey. It is important to remember that with any paid social ad, the experience is interruptive. Our ads interrupt a user’s news stream and get in the way of other content. To ensure that our paid advertising is most effective, we must deliver content that both adds value to the user and speaks the language of that particular social platform. If we are targeting Think or Do state customers via paid social, we must avoid messages that are too salesy, as our audience is unlikely to engage with a cheap sales pitch on Facebook, Twitter, Instagram or Snapchat. Also avoid generic branding and logos. Paid social content must imply value or utility, or our audience won’t want to engage with or dwell on our ad. Organic social streams are getting harder to penetrate with advertisements. Just as marketers are starting to feel comfortable advertising on social channels, platforms change their algorithms. Given these unpredictable limitations on reach and targeting, we recommend using organic social media only for publishing See state content, which is applicable to the broadest audience. This type of targeting won’t result in a high conversion rate, but it will grease the skids for future conversions as we build brand affinity with our largest audience. Aligning native ads to the customer journey is best done through See or Think state content because the ad is already surrounded by other See and Think state content. We’ve all seen successful native advertising on sites like CNN or BuzzFeed. They are successful because they don’t look or feel like an advertisement. This content honors the user’s intended experience on the site and blends in with the other articles on the site. Native advertising doesn’t work for Do state content because Do state is salesy. When users interact with a Do state message in a native ad, they will be turned off because it doesn’t align with their overall experience on the site. It is a matter of trust: If a user is on CNN.com then they expect newsworthy, value-added and informative content — not a sales pitch. This out-of-context advertisement can seriously hurt a brand’s credibility, authenticity and trust. Email is one of the easiest digital mediums to target because it is effective for all journey states. Marketers can hone a very targeted message for each journey state through drip emails, engagement programs, or by segmenting a newsletter send. Basically, any time we send an email we can make sure it’s contextually relevant to the state of that particular buyer based on what we have tracked in our CRM. Paid search, while ideal for Do state content, can also be used to target See or Think audiences even though the conversion rate will not be as high. Paid search has the power to identify buyer intent for an unknown audience better than almost any other digital marketing medium. This is done through keywords. By bidding on a relevant keyword, we can capture an individual at the time they are looking for our product or service. High intent, Do state keywords include: buy, for sale, price, free trial, comparison, rating, review, demo, cost, best, list of, top, and alternatives. If we bid on any one of these high intent keywords combined with keywords representing our service offering, like “price digital media buying,” or “buy digital media buying,” we can guarantee we are attracting Do state audience members. To prevent See and Think state searchers from seeing our Do state ads, add informational keywords as negative keywords to your campaign. Marketers should keep in mind all three customer journey states when developing an organic search strategy. The first step is to create content that aligns with search queries at each individual journey state. Do state content is less evergreen and includes transactional content like white papers and infographics. Therefore, for organic search ads a more cost effective route is to create content for See and Think state audiences. This content is evergreen and can produce returns over a longer period of time. Digital marketing is a beautiful space for personalization. We can target the customer journey states, avoid overlap and produce a personalized media experience. A well-segmented database makes this process even more achievable.